In 2019, SIFC students received offers from top US Art Schools again! Including Pratt Institute，Parsons The New School for Design, School of Visual Arts，School of the Art Institute of Chicago，Maryland Institute College of Art，Savannah College of Art and Design，Otis College of Art and Design. Why do SIFC students stand out in the Arts? and get offers from top US Art colleges? The aim for the art department at SIFC is to teach students the life skills needed to become creative and critical thinkers, who are able to become self-directed learners through a well-developed and thorough art curriculum. Through exploration of both western and Chinese style art, artists and art history, students will become more knowledgeable of the art world preparing them for their future studies abroad. The art curriculum offers rigorous, meaningful and significant learning which gives students a well-rounded and comprehensive art education that prepares students fully for their application at the top art universities and colleges around the world. Students will be taught the fundamentals of general art and design which will be presented through detailed and creative lessons which allows students to explore and develop their creativity, imagination and problem solving abilities. The art curriculum has been specifically designed to ensure students have significant learning experiences which inspire creative self-expression and develop a lifelong appreciation of the arts. Students will be taught how to use a number of different mediums and the techniques associated with those mediums to produce art works. They will all then have the opportunity to showcase their works through community and school exhibitions and displays for the campus. The art curriculum is designed to ensure that students are competent and diverse in their artistic abilities. The curriculum offers drawing, painting, mixed media, collage, animation, printmaking, game design, 3D art, mural painting, and digital art including the use of Photoshop, Illustrator, After Effects, Maya, 3D Max, and Unity taught by teachers with expertise in their subject areas. Imbedded within the structure of the curriculum are project themes which explore various cultural identities and ideas aimed to make students more culturally aware of the world around them and outside of their native countries. The art curriculum throughout the duration of the students school experience incorporates theoretic, art making and curatorial practices. The structure design and content of the art lessons provides students with pleasure, enjoyment, and a deepened awareness of themselves and their place in their environment, community, and culture. It fosters respect for and appreciation of the diverse cultural heritages and values of the world. The art curriculum is fundamental to the development of individual potential, social responsibility, and cultural awareness and contributes to the intellectual, emotional, social, and physical development of the students. Your first exposure to art may be in a comic book, a mural, or your attempt to draw at random. When you find that your eyes are always shining for these beautiful and interesting things, the door of art has been opened for you. Some children are born to be artists. So, in SIFC, what we want to do is to find their differences, and help them, to make it. In the art class, we see a group of children who really love art and are meticulous about their works and make unremitting efforts for their own pursuit. Let's take a look at some of the recent artworks of SIFC students. First, follow our art teacher John to SIFC's graphic design class. The students in Graphic Design class learn critical thinking, element and principles of design and typography. They also learn about composition as well as the foundation and fundamentals of drawings such as perspective and anatomy. We use programs such as Photoshop, illustrator, After Effect, Premiere Pro, and Maya to make logos, posters, concept art, character design, story boards, Movie trailers and Music videos. The new graphic design 1 students this year have exhibited phenomenal artworks using Photoshop. The project is to recreate an existing concept art and student used a Wacom tablet to paint from scratch. They had to create concept art with great composition, color and visual appeal. The students were intimidated in the beginning, mentioning that their task seem hard and impossible. After showing them a demonstration in Photoshop, and with a little encouragement, the students worked on their paintings. This project was no easy task since each student had to learn how to paint everything in their concept art, whether it was grass, rock or clouds which for some of the students meant going back to their drawing and painting fundamentals. In this project the students also had to use an arsenal of tools in Photoshop as well learning principles of design and using them practically on this project. They all learned the rules of third, the difference between foreground, background and middle ground. The end result is amazing. Each student's work are beautiful and yet have different moods, color and painting techniques. It took a couple of weeks and a lot of refining but every student was able to make a beautiful masterpiece. Their next project will be something worth looking forward to. Now let's take a look at another art teacher, Angie's class. This semester, our courses are structured by modern art movements. 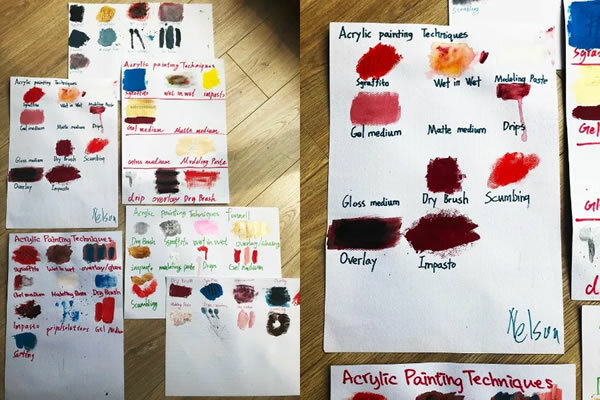 Every week we target one art movement of the 20th century and students are given the opportunity to experiment with artistic methods and techniques that characterise the movement. We started with Cubism, which is often considered the beginning of modern art, a movement founded by Pablo Picasso and Georges Braque. Rich adding color to his Cubist portrait. Students were introduced to other avant-garde movements including Futurism, Constructivism, Suprematism, Dadaism, etc. Greg working on his Suprematist art piece. Suprematism is an abstract art movement founded in Russia, characterised by the depiction of purely basic geometric shapes and the use of a limited range of colours. Yoyo and Monroe carefully executing their Constructivist/Suprematist works using the masking technique. Cherry working on her suprematist piece next to her completed dadaist poem. Blanche (left) and Sheryl (right) on their suprematist/constructivist pieces. The Art Appreciation & Studio II class is on the week of Abstract Expressionism. Students have recently completed action paintings in partners and are currently working on visual descriptions for their finished works. To prepare students for more advanced art making in high school, they are taught basic figure drawing techniques as well as acrylic painting techniques. In the process of creation, students continuously experience life, feel life, re-observe, understand, know the world around, and meet their inner love of art. Their works may not be so dazzling now, but I believe they will all create eye-catching classics. Looking forward to these future masters of art for our life to create unlimited surprises. If you missed the SIFC Open Day in March, we have another one on 27th, April! 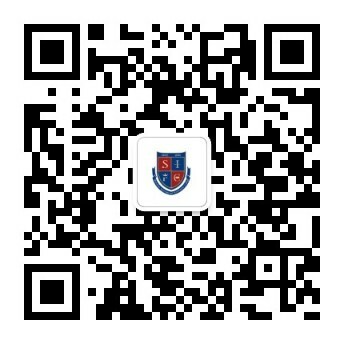 We welcome parents and students to make an appointment to learn more about the style of SIFC.